Katherine Klevins Lenoir, a Licensed Practical Nurse working at a Florida Healthcare and Rehabilitation Center, accidently administered a large dose of narcotics instead of cough medicine that was prescribed for a patient. Although a near-fatal error, her actions were not criminal at that point. So what led to Lenoir’s criminal prosecution? It was the blatant manipulation of medical records to cover her tracks. In a Florida court of law Lenoir pled guilty to reckless abuse of a protected person, a class A felony. Her patient survived the incident, but Lenoir faces prison for her actions. Why Are the Elderly Susceptible to Abuse and Neglect? It in unconscionable for the vulnerable in our community to be treated with neglect or abuse. Yet statistics tell us that ten percent of Americans over the age of 60 have faced elder abuse in some form. Fragile mental and physical capacities, physical and social isolation, and fear are all factors that make these individuals easy prey to both accidental and intentional abuse or neglect. In fact, almost 50 percent of dementia patients are targeted for abuse or neglect. Any purposeful act that could reasonably result in either physical or psychological injury, or even the encouragement of such an act, is a crime in Florida. Negligence is a caregiver’s failure to provide basic necessities, including food, clothing, medicine, and even supervision. Essentially, when a caregiver does not provide the fundamentals that a reasonable person would determine rudimentary, it may be classified as negligent. If overt actions lead to permanent disability or disfigurement, or if they involve serious bodily harm, it is a felony. Unlawful activities might include aggravated battery, malicious punishment, caging, or torture of this protected class. 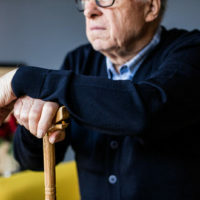 If someone has knowledge of either a single incident or repeated instances of elder neglect or abuse and does nothing to report or intervene on behalf of the victim, that person’s culpability becomes actionable. When a vulnerable adult experiences abuse, neglect or exploitation, there may a cause of action against the perpetrator, which can result in actual and punitive damages. The legal action may be brought by the victim, or on behalf of the victim by that person’s guardian. If the crime results in death, the action may be brought on behalf of the victim by the personal representative of the victim’s estate. The prevailing party may be entitled to recover legal fees in addition to damages. Persons involved in elder abuse may be charged with first, second or third degree felonies, depending on the circumstances. If the charge of aggravated assault or aggravated battery on a person aged 65 or older is found, the perpetrator may face 3 years in prison and up to $10,000 in fines. Additionally, victim restitution and/or community service may be ordered, on top of any fines imposed. If your loved one has suffered personal injury due to elder abuse or neglect, the Florida personal injury attorneys at The Law Offices of Robert W. Elton can help. Contact us today for your free, confidential consultation.